Baking beautiful, delectable creations with low carb flour can be difficult. See, you can’t just swap conventional all purpose flour with one of the low carb gluten free flours below, and expect that favorite cookie recipe to turn out just like Mom’s. Whether it’s low carb bread, low carb crackers or low carb brownies, these low carb flour options have got you covered! Toss them on your low carb shopping list, and I promise you won’t regret it! In a quarter cup serving, you’ll get 100 calories and a whopping 22g carbs in flour! Whole wheat flour is marginally better than the bleached stuff, with an extra gram of protein per quarter cup and the same 22g carb. Let’s take a look at the content of various keto flour options and when it’s appropriate to use one over the other. Spoiler alert: they’re not all created equal. Coconut flour has been on the rise due to an increase in paleo foods, gluten free diets, and low carb meal plans — as well as the long standing popularity of all things coconut. Coconut flour is a soft, absorbent flour made from the dried meat of these keto fruits. It’s a byproduct of coconut milk, which gets dried at a low temperature before being ground into a fine low carb flour. How to make coconut flour is easy, BUT, extremely time-consuming. If you’re already following my how to make coconut milk guide, then you might as well dry the pulp for a homemade low carb flour. If not, save yourself the headache and buy a bag at the store! There’s a bit of a learning curve when it comes to baking with coconut flour — for this reason, I suggest sticking to recipes that use coconut flour first, then testing out variations and swaps of your own. Add more liquids. This will prevent coconut flour from yielding crumbly and dry treats. This can be done with low carb milks, oil, butter or eggs. Needs a binding agent. More eggs, xanthan gum or psyllium husk can be added to your recipes for binding. Great low carb flour for frying! Almond flour is a type of milled flour made from finely-ground almonds. I like almond flour a lot – in fact, it’s my personal favorite low carb flour. It’s lower in carbs than coconut flour, and works well in baked goods, both sweet and savory. As far as low carb flour options go, it looks, tastes and has the most similar baking tendencies to wheat flour. Unlike making coconut flour, how to make almond flour is suuuper easy — just toss blanched almonds into a blender or food processor, and pulse on high until the keto nuts are transformed into a powder. Store bought almond flour will give you a finer grind (with is important for some keto recipes), but the DIY version is sure to save you a few bucks. Almond flour is heavier than regular flour and doesn’t bind as well – which is why baking with almond flour often calls for a gelatinous ingredient such a psyllium husk, ground flaxseeds or xanthan gum to help the product stick together. When purchasing almond flour, there are different grain sizes available. Go for the the “super fine” almond flour, as I find it easiest to work with. Almond meal vs. almond flour are essentially the same thing, with one key difference: almond meal is made from almonds with the skin left on. So as a result, almond meal will add small brown flecks to baked goods, where almond flour is closer to what you’d get with a traditional flour. The calorie, carb, and protein counts are about the same between almond meal and flour, and it can be used interchangeably with its blanched counterpart — just keep in mind that swapping this low carb flour will change the look of the dish. Think of it as the difference between say, bleached white paper and recycled paper — the latter calls more attention to the fact that you’re using a flour alternative. How to make almond meal is the same as making almond flour, just use almonds with the skin instead of blanches, and you’ll be good to go! My second favorite low carb flour is peanut flour. 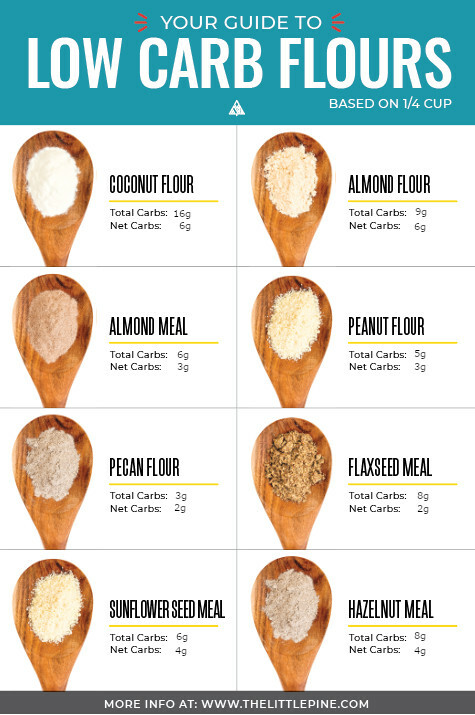 This low carb flour is extremely different than the other options on this list, as it’s made from partially defatted low carb nuts (vs. the entire nut). This results in a low carb flour with significantly less fat / calories, and more protein than other keto flour list options. 4 grams of fat, 8 grams of carb and 16 grams of protein per ¼ cup. Pecan flour has a mild and slightly different taste than the other low carb flour choices on this list — but tends to behave about the same. Since this low carb flour is harder to come by, I rarely use it in baking — however, you can swap almond flour for pecan flour and it won’t give you any issues. In terms of nutritional content, pecan meal is one of your best bets for low carb flour. Another nut flour gem, hazelnut flour isn’t as popular as almond meal, but it sure is tasty! Bob’s Red Mill makes a version, or you can whip up your own batch by grinding the nuts in a blender. Like almond meal and sunflower meal, hazelnut flour is made from ground hazelnuts, with the skin left on. Perhaps one of the lesser known paleo flour types, sunflower seed meal is a high protein, low carb flour that works as an alternative to nut flours. The main benefit of sunflower seed flour over other low carb flour options, is that this ingredient is nut free! However, if you’ve tried sunflower seed butter, you know what I mean when I say, sunflower seeds have a very particular flavor. Where almonds are mild and work in foods both sweet and savory, sunflower seed meal works best when accompanied by flavors like low carb chocolate or low carb fruits. Rather than grinding your own sunflower meal or grappling with the mysteries of coconut, make things easier on yourself and pick up a bag of low carb baking mix! The beauty of Bob’s Red Mill low carb flour mix is, you can swap out traditional flour cup for cup without a second thought. This ready-made low carb flour recipe contains a blend of oat bran, wheat bran, soy flour, rye, and flaxseed meal and contains only 7 grams of NET CARBS per serving! Carbquick is essentially a low carb version of Bisquick (creative name, I know). Just add water and you’ve got yourself a handful of low carb recipes. I haven’t personally baked with Carbquick – and to be honest, it’s not my thing (it’s high in overall carbs and has a few ingredients I don’t eat). Bottom line is, baking with low carb flour just takes a little getting used to. While it can be a intimidating, some flours are more challenging than others. My recommendation is to start off with an established recipe, versus trying to experiment. Approach with an open mind, and get to know the ingredients a little better before diving into a new baking challenge. Let me know your favorite low carb flour in the comments below! « Cauliflower Potato Salad — The Most DELICIOUS Keto Salad Ever! !